Three years ago today, the creator of remote viewing, Ingo Swann, moved beyond his mortal body and, as will all of us in the end, entered an eternal world of infinite possibility. 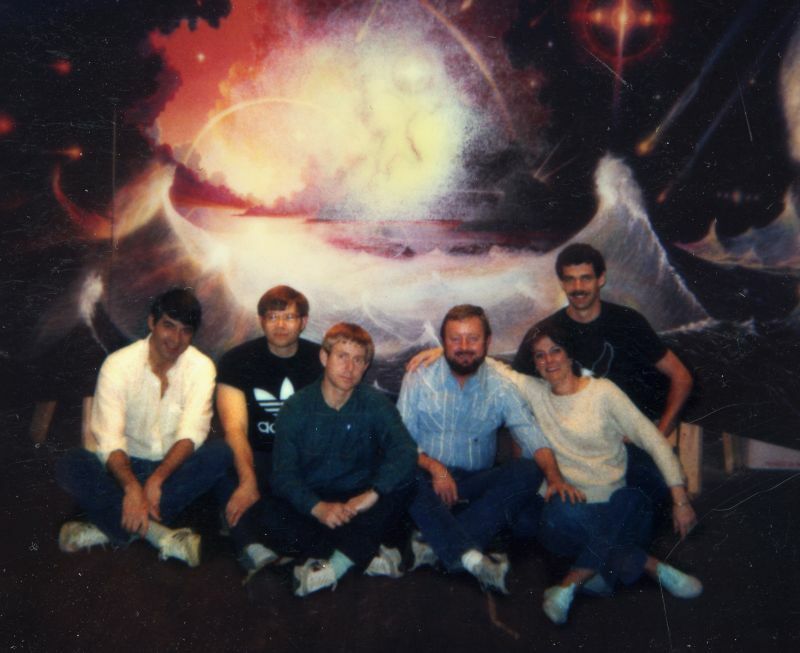 To commemorate that sad but affirming transition, I am celebrating Ingo’s life today by posting here the almost transcendent experience I had when Ingo treated me and my fellow Star Gate remote viewing students to our first look at Ingo’s masterpiece, Millennium. It happened on February 21, 1984, a Tuesday. 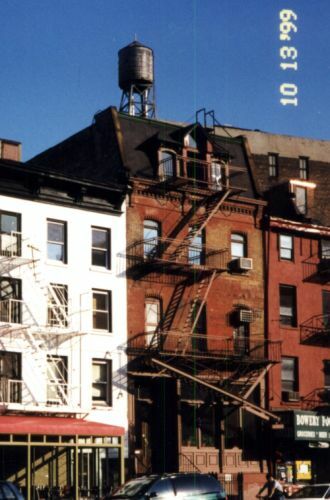 On our first day after arriving in New York for remote viewing training under the contract the U.S. Army had signed with SRI-International, Ingo had invited the four of us (Charlene Shufelt, Ed Dames, Bill Ray, and myself) down to the building he owned in Manhattan’s Bowery. The story picks up from there. Ingo Swann’s building along New York’s Bowery. Ingo’s building had a main basement, which we were now entering, plus a sub-basement in which he stored his large collection of files and reference material. The main basement was at that time set up exclusively as a studio. The flooring was dark, heavily-varnished boards that were cupped by years of heavy use and moist air. The walls were dingy and patched. There was the detritus of art everywhere – canvas stretchers, half-finished paintings, assorted tools and objects for reference, more dilapidated furniture. Impregnating everything was the smell of turpentine and linseed oil – fragrant odors to someone who wanted to create from their imaginations visions for others to experience. “Millennium” was one of those visions, and it awaited us at far end of the studio, boldly swathed in light. It was easy to become lost in the painting. It was huge – the largest I had at the time ever seen, and only since dwarfed in my mind by an immense Bierstadt I later saw at the National Gallery in Washington. 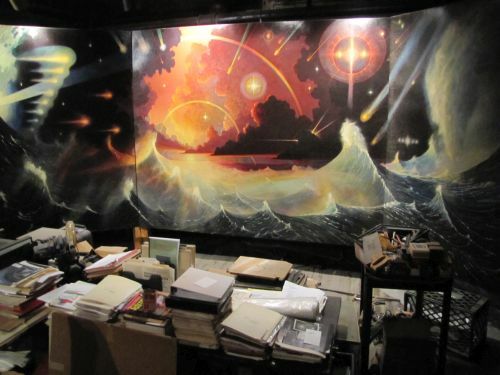 “Millennium” was a triptych – painted on three canvas panels, each taller than me, and probably half again as long as its height – about 27 feet long, all told. As I took it in, I was not conscious of the timbers that anchored it from behind, so it seemed almost to float a foot or so above the floor. The side panels canted slightly inward, seeming to embrace me. A wooden bench sat at a comfortable distance from the painting, where Ingo bade us sit. He then turned out all the lights in room but those flooding the painting and raised the volume on his stereo to play Kitaro’s weighty Silk Road Suite. The painting contained nothing but ocean and sky. From where we sat, I couldn’t take it all in at once. Instead, when I looked forward my peripheral vision was filled by the massive waves that curled in from both edges of the panels on either side. These waves seemed to loom above us, while the ones in the foreground merely seethed and tossed. Towering thunderheads ringed the distant skies. In the middle distance, though, clouds broke and the seas began to calm. Centered in the horizon a sun blazed a golden pathway across the serene ocean between a canyon of clouds towards us, blocked finally by the tossing waves that lay immediately before our eyes. Intruding into the picture were mysterious lights – pearl-like strings of iridescence, clusters of glowing orbs, with a hint of otherworldly-origin about them. The name suggests something Biblical, but Ingo wasn’t religious in any conventional sense of the word. He had spent time among my own Mormon people in Salt Lake City. And he was deeply interested in Catholic reports of appearances of the Blessed Virgin Mary. But even this came more from a fascination with the paranormal aspects of the events than from anything religious associated with them. For me, the painting represented both the ponderous things of the universe, and the imponderables of existence. It brought home, if only imperfectly, the inconceivable power latent in the cosmos, yet revealed hidden knowledge suffusing what we see – things beyond the manifest world which are just as marvelous and, perhaps, just as powerful. Paul H. Smith is creator of the Remote Perception: Basic Operational Training home study course. . . Buy it here!
. . . and author of The Essential Guide to Remote Viewing: The Secret Military Remote Perception Skill Anyone Can Learn. See my bio on the "About" page. Thanks, Gary, for yours and Martha’s thoughts about Ingo. So beautiful and wonderful! I have finally realized what it is that I feel towards you, Paul, regarding Ingo. Its Jealousy! Oh, what I wouldn’t give to have met him in person, seen those paintings ….and chatted for a while. Thanks for sharing these sacred moments. Well, Joe — at least that’s something worthy of being jealous about! 🙂 I wish Ingo could personally have met all the great folks in the remote viewing universe that are, in an interesting way, his only “descendants.” But at least we got him to several of the remote viewing conferences, which gave many folks an opportunity to shake his hand and hear him speak in person. OMG, you all were so young then. ha ha ha ha Couldn’t help myself, Paul.